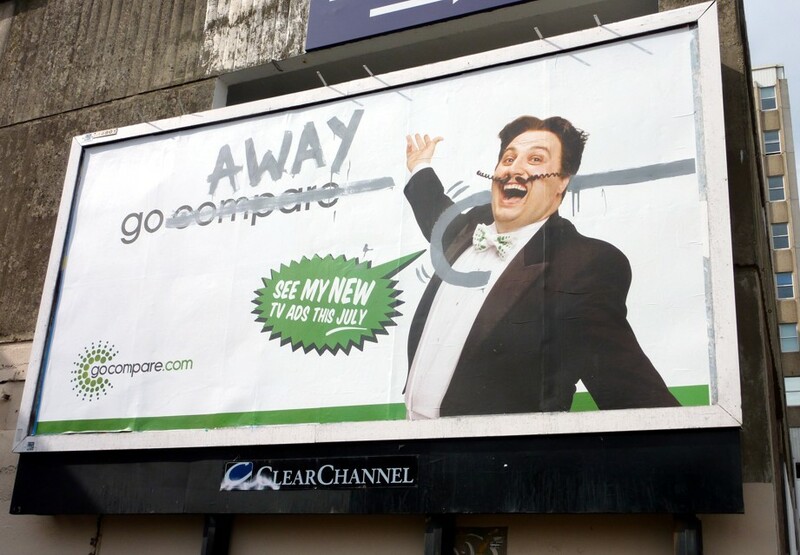 I’ve noticed there appears to be a coordinated attempt to subvert the latest ‘Go Compare’ billboards. I have seen two in Brighton, and read about others in Kent, and in the midlands. Of course I loathe the Go Compare ads and laughed when I saw the first one. But on second glance at the snap I took below, and the other ones which say “go and get some singing lessons too” are really rather mild mannered graffiti are they not? And rather art directed? Oh wait. Go Compare are doing it to themselves. How clever. Is that Go Compare I see rigging up some publicity with the BBC’s Sue Barker? Wonderful. After all everyone is profoundly sick of these insurance broking Go Compare adverts and their execrable pseudo-operatic earworm. Let’s use the reality of the fact that everyone is sick of it. For now we are adding faux ‘subvertising’ to their self-harm inducing brand of ‘post-modern’ irony that winks at you as you finger the gouting wounds that were once your sensory organs. Important to notice too, that what is being subverted is not the brand, but the character. But I can’t help doffing my marketing cap to them. Brilliant job. This entry was posted in Uncategorized and tagged Go compare, meerkats, subvertising, Sue Barker. Bookmark the permalink.